As I mentioned in my last post, card making is in full swing this month, with lots of occasions that need a special card or two. Mr C’s sister recently moved into a new home and today we had the pleasure of going to see it (and of course our nieces!) It was about an hour and and half drive each way, so I got a good dose of car crocheting done and no one vomited in the car (mainly due to me remembering to give our 3 year old some travel sickness medicine before the journey!) All in all a good day was had, including a trip to the ice cream parlour which is owned by another family member. Super simple, but it made me smile! I used my Cricut ‘Type Candy’ cartridge to cut the lettering and used the negative on the card, sticking down the middles of the two ‘e’s and the ‘o’ after carefully removing them using a craft knife. I topped it off with a single diamanté at the top of the flagpole, because I can’t make a card without a little bit of sparkle. This card took around 10 minutes, but Mr C was impressed (and amused!) by the castle idea. 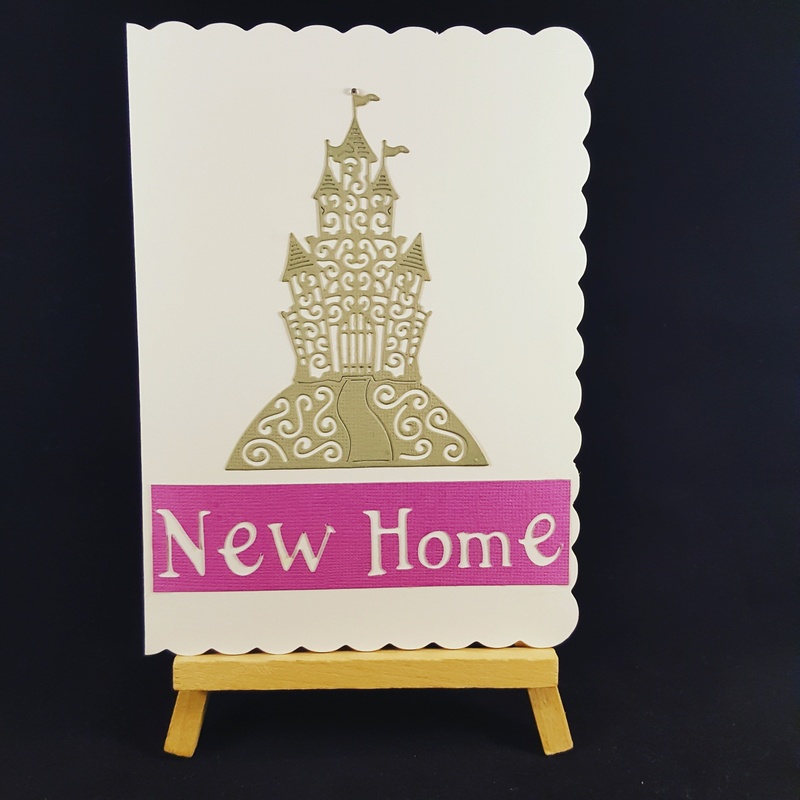 I think I might keep this idea banked too, as sometimes new home cards can be a bit tricky to make using existing stash! Next Post Ready, Steady, Grow! Love this, will bring a smile to anyone moving to a new castle! Thank you, I’m hoping so! It sounds like you had a great time! And I love the card. The castle idea is great! We had a lovely time, thanks. It was the castle die that broke my old die cutter and I nearly sold it, glad I didn’t now though. Great use of a castle die, and a fun idea. I like the way you have made the sentiment too – a little twist that works splendidly. Thank you, I quite liked the effect of using the negative for a change, although I had to trim it carefully!